The e-commerce stock sold off with the market last month, but it's bounced back in November. Shares of Etsy, Inc. (NASDAQ:ETSY) dipped 17.2% in October, according to data provided by S&P Global Market Intelligence. The e-commerce stock posted its biggest decline in 2018 last month, but there appears to be no company-specific news behind the sell-offs. 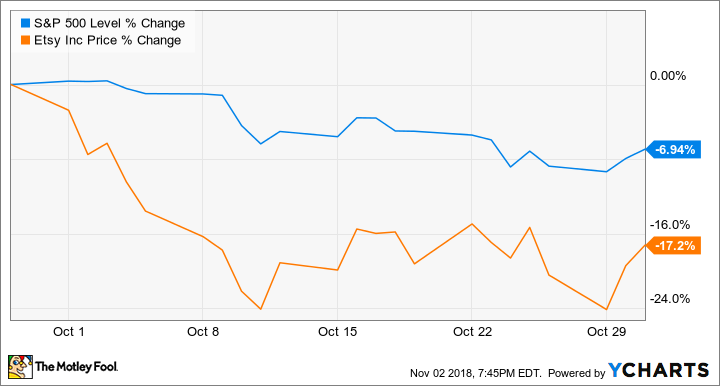 October saw the major U.S. indexes post their biggest percentage-based contraction since February 2009, and Etsy stock trended lower along with the broader market. The company has been delivering strong earnings performance and platform innovations this year, but it's still a growth-dependent tech company -- and stocks in that category tend to be hit harder than the rest of the market during pullbacks. 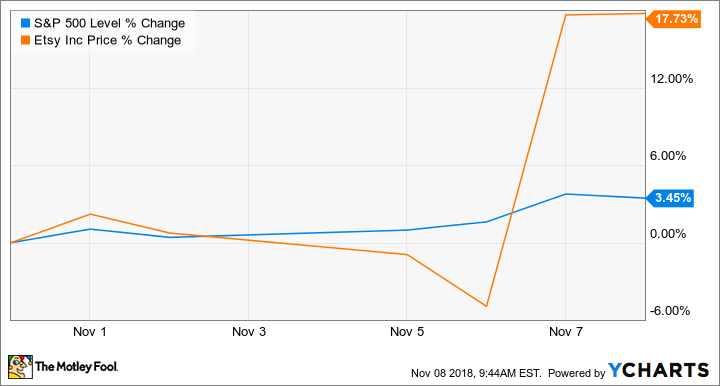 While October might have been a bit scary for Etsy shareholders, they didn't have to wait long for respite. The company published third-quarter results after the market closed on Nov. 6, delivering impressive growth and earnings that beat the market's expectations. Sales for the period rose 41% year over year to reach roughly $150.4 million, in line with the average analyst estimate. Gross merchandise sales (GMS) conducted on the platform also saw strong growth, rising 21% year over year to land at $922.5 million. Revenue growth substantially outpaced GMS expansion as a result of service pricing increases implemented by the company. Non-GAAP adjusted EBITDA expanded 49.5%, hitting $34 million, and GAAP net income of $0.15 came in well ahead of the average analyst estimate's call for per-share earnings of $0.07. Etsy stock has rebounded following its third-quarter results and positive movement for the broader market. Shares are up roughly 17.7% in November so far. The company raised its full-year guidance following its strong third-quarter performance, and now expects annual sales growth between 35% and 36% (up from growth between 33% and 35%) to reach revenue of roughly $598 million. Adjusted EBITDA is now expected to come in between $132 million and $138 million, up from the previous target for EBITDA between $124 million and $136 million.